Our family-friendly Bloomington (just a short distance from the IU campus) & Columbus restaurants offer both delivery, carryout & dine-in options. We serve pizza & pasta with personality and so much more! 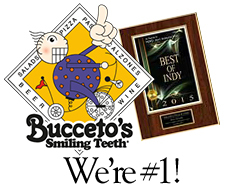 We won the 2018 Herald Times Readers' Choice award for Best Pizza, Best Italian, Best Lunch, Best Catering and Best Vegetarian in Bloomington! 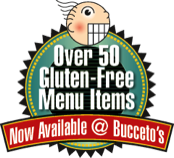 Gluten-sensitive pizza and pasta lovers can now enjoy an array of gluten-free menu options at Bucceto's in Bloomington. All of the ingredients and recipes on our gluten-free menu are gluten-free. We use every effort to avoid cross-contamination. However, wheat flour is used in the kitchen, and there is a possibility of cross contact. We do not recommend these options to severely gluten-sensitive individuals.